I’ve barely posted lately and I’ve got good reason too! We have been so busy enjoying all of the good fresh air that the summer brings! Here in Canada the winters are long and the summers far too short so when the warmer weather finally starts to hit – I am quick to get my children outdoors as much as possible! This summer we decided that Jacob could participate in a sport of his choosing and after narrowing it down to soccer or t-ball we let him decide and in the end he chose T-Ball over soccer and actually ended up playing in two leagues! I’m not sure how we survived the month of June when we had four nights a week of blastball/t-ball but somehow we managed and now we have just the one league on the go and a simple two nights a week schedule! What can I say about T-Ball? 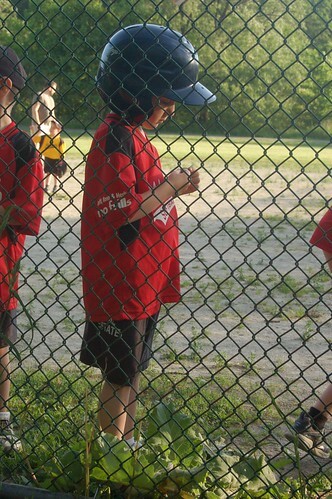 First I can say that I am not sure that my son LOVES T-Ball….this is not me being a harsh over critical mom but I really don’t believe that my son is a natural athlete – natural intellect? ABSOLUTELY…but athletics is something that he will have to work towards and I personally believe that it’s good that kids have areas in their life that they have to try hard and use effort to be successful. 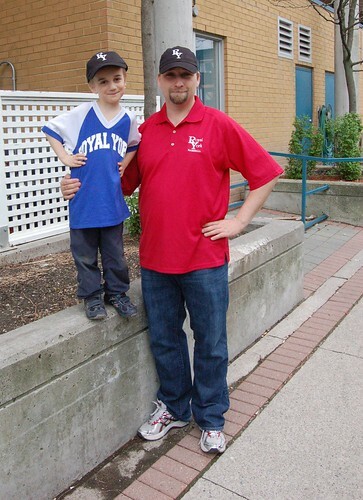 Jacob’s T-Ball team right now is for 3-5 year olds so he is definitely one of the older kids on the team but his coordination is not so fantastic…in fact I’m pretty sure that his favourite part of T-Ball is when it’s over and the kids all sit around and have snack time…heh. I’m ok with that fact because he doesn’t say he hates T-Ball and he doesn’t ask not to go…he seems genuinely happy when he’s there and the league he currently plays for is not terribly competitive so he just kind of does his thing. I have my reasons for wanting my children to be involved in extra curricular activities but for Jacob specifically I wanted him to be social and experience new adventures with other kids – in the long-term I hope that extra curricular activity will keep him busy through his teenaged years and ultimately out of trouble…we’ll see – a parent can hope. 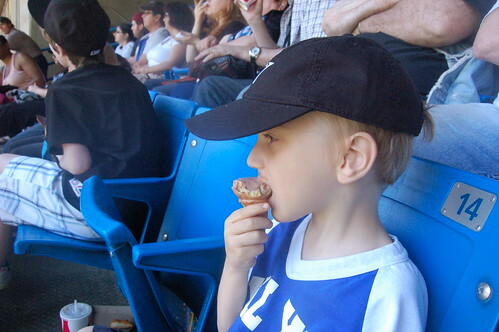 What’s been cool is that both leagues Jacob has participated in have had days where they went to the Blue Jays game here in Toronto and Jacob got to go to a ball game with his dad! The second league is going to the baseball game in July so he’ll get to partake of the baseball game again except this time his little sister will be in tow! I really love seeing him participate and enjoy extra curricular activities as it’s just nice to see him being so social and making new friends! I think he’s going to play hockey in the fall and I’m only slightly terrified about that one! Eek! We’ll see how that experience goes for him…heh.